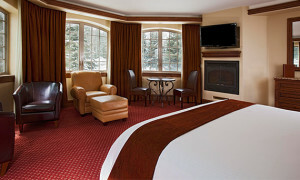 These large Vail hotel rooms with spectacular views of Vail Mountain offer a choice of one king, two queens, or two double beds. Each of our Vail Mountain View Rooms are equipped with a separate walk-in shower with body spray jets and separate large soaking tub. Rooms feature the finest linens and terry, plush bathrobes, mini-refrigerators, coffee/tea service, and microwaves. The wet bar area provides a granite countertop with two stools. Rooms feature a 40” flat panel television and DVD player. Most rooms have gas fireplaces and step out balconies. 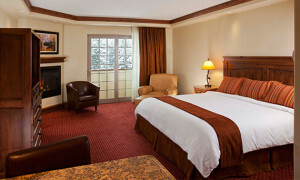 These spacious Vail hotel rooms with views of Vail Village and valley floor feature either one king, two queen beds, or two double beds.Each of these Vail Village hotel rooms is equipped with a combination shower and soaking tub. Rooms feature the finest linens and terry, plush bathrobes, mini-refrigerators, coffee/tea service, and microwaves. The wet bar area provides a granite countertop with two stools. Rooms feature a 32” flat panel television and DVD player. 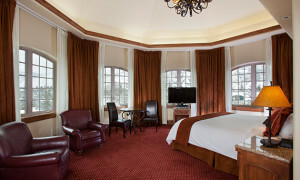 These large, spacious Vail hotel rooms in one of our unique octagonal shaped towers are bright and airy with numerous windows and have wonderful panoramic views of Vail Mountain and Golden Peak. 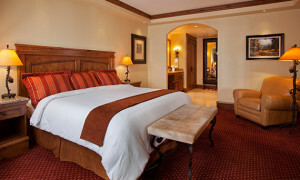 These luxury resort accommodations in Vail feature one king bed. The upgraded amenities in these luxury Vail hotel rooms include towel warmers, marble bathroom floors, and double oversized showers with body spray jets and a rain shower head. Rooms feature the finest linens and terry, plush bathrobes, mini-refrigerators, coffee/tea service, and microwaves. The wet bar area provides a granite countertop and there is a work table with a casual seating area. Rooms feature a 40” flat panel television, DVD player, and have gas fireplaces. 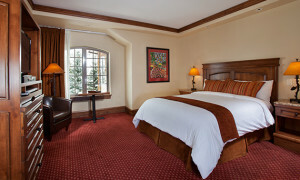 These large Vail Village hotel rooms in one of our unique octagonal stone towers are bright and airy with numerous windows and views into Vail Village and across the valley floor. These rooms have one queen bed. The upgraded amenities in these Vail Village hotel rooms include towel warmers and marble bathroom floors. Each are equipped with a walk-in shower. Rooms feature the finest linens and terry, plush bathrobes, mini-refrigerators, coffee/tea service, and microwaves. The wet bar area provides a granite countertop with two stools. Rooms feature a 32” flat panel television and DVD player.